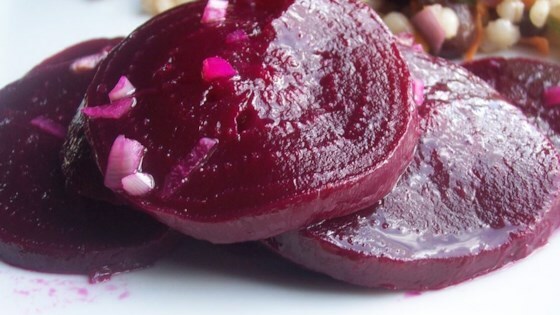 "This is a simple but elegant dish of beets tossed with a tangy garlic vinaigrette dressing. Feel free to use more than the two cloves of garlic--I do!" We didn't care for this recipe at all. These even go over well with non-beet people. Savory and sweet at the same time. Makes good use of a somewhat neglected veggie. I made this for a summer family picnic. It was a hit even with the kids! It was nice to have a new idea! We used canned beets, it kept the prep time down. My daughter loves this. I pressure cooked the beets for 12-20 minutes depending on size. I found this combination wonderfully delicious. It was just right. If you eat beets... this is good and simple. This recipe was delicious and although it took my beets about 40 minutes to cook (because they were large)it was still very quick and easy to prepare. Easy, but it does take a while. Good plain or add to green salad.